Security Council votes on extending ban on illicit crude oil exports from Libya. The Security Council today adopted a series of resolutions by which it extended the mandates of United Nations missions in the Golan, the Darfur region of Sudan and Mali, and renewed measures against illicit oil exports in Libya. In resolution 2361, which extends the mandate of the UN Disengagement Observer Force (UNDOF), the Council condemned the use of heavy weapons by both the Syrian armed forces and armed groups in the ongoing Syrian conflict in the area of separation between Israel and Syria, and underlined that there should be no military activity of the armed opposition groups in that area. It also urged Member States to convey strongly to the Syrian armed opposition groups in UNDOF’s area of operations to halt all activities that endanger UN peacekeepers and to accord them the freedom to carry out their mandate safely and securely. UNDOF was established by the Council in May 1974 to maintain the ceasefire between Israel and Syria, to supervise the disengagement of Israeli and Syrian forces, and to supervise the areas of separation and limitation. Similarly, the Council adopted resolution 2363, in which it extended the mandate of the UN-African Union Mission in Darfur (UNAMID) until 30 June 2018. Among other things, the Council also decided that from 31 January next year, UNAMID’s troop and police ceiling shall be reduced to consist of up to 8,735 military personnel and 2,500 police personnel, including individual police officers and members of formed police units. Also today, the Council extended the mandate of the UN Multidimensional Integrated Stabilization Mission in Mali, known by its French acronym MINUSMA, through June 2018. In adopting resolution 2364, the Council also decided that MINUSMA shall continue to comprise up to 13,289 military personnel and 1,920 police personnel and that its strategic priority shall remain to support the implementation by the Government, the Plateforme and Coordination armed groups, as well as by other relevant Malian stakeholders, of the Agreement on Peace and Reconciliation in Mali. The Council also today renewed the measures against illicit oil exports from Libya as well as the mandate of the expert panel assisting the sanctions committee through November this year. In adopting resolution 2362, the Council condemned attempts to illicitly export petroleum, including crude oil and refined petroleum products, from Libya, including by parallel institutions which are not acting under the authority of the Government of National Accord. The Council also raised concerns about activities which could damage the integrity and unity of Libyan State financial institutions and the National Oil Corporation, and stressed the need for the Government of National Accord “to exercise sole and effective oversight” over the National Oil Corporation, the Central Bank of Libya and the Libyan Investment Authority. In the same resolution, the Council decided that the Panel of Experts on the issue shall provide an interim report on its work no later than 28 February 2018, and a final report, with findings and recommendations, by 15 September of next year. 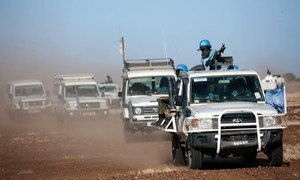 The African Union (AU) and the United Nations are proposing 44 per cent and 30 per cent reductions in their troop and police presence in Sudan's Darfur region as a step towards an eventual exit, a senior UN peacekeeping official told the Security Council.